Horrocks Beach is a popular and picturesque swimming beach in the beautiful seaside town of Horrocks. 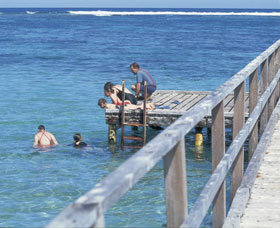 Enjoy swimming, fishing, beach combing or indulge in a range of water activities. During late spring, visit the specially constructed platform to look out for Humpback whales on their migration south. You can swim out to the pontoon that is anchored during the summer months. If you are partial to fishing, then be sure to try your luck on the jetty. The bay is surrounded by coral reef where you can take a walk along the reef and neighbouring rock pools during low tide to investigate the diverse marine life. Alternatively, if relaxing is all you want to do, soak up the sun on the white sandy beach while the children play in the nearby adventure playground. Located 22 kilometres north west of Northampton, or four and a half hours north of Perth, Horrocks is a stunning place to visit with plenty to do for the whole family.